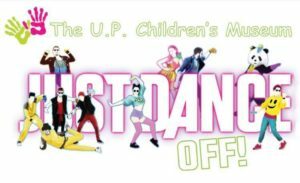 The “Just Dance Off ” event will be a single elimination dance tournament for parents. 5:30-8:30 p.m. Adults will dance while kids are free to play in the museum. $25 suggested donation for adults, kids are free. Pizza and beer/pop will be provided. All funds raised will go toward the Museum’s Play it Forward 2019 campaign to provide 350 year-long memberships to families of need. Pay at the door or online by designating your donation to the Playmakers Fund in the menu provided.